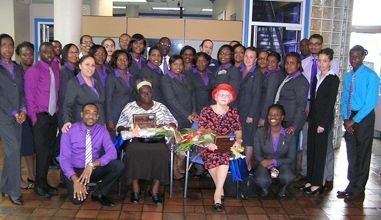 Muriel Gunsam and Louvina Arrindell were among 19 nominees, from whom they were chosen as winners, being shining examples for their admirable qualities. Both women continue to serve God, be of service to others in their communities and contribute to their businesses. Julia Louvina Arrindell, affectionately known as Aunty Lou, was born January 12, 1950. She grew up in the community of Belmont with her parents, who were peasant farmers, which allowed them to provide food and other basic needs for their children. She helped her parents tirelessly in the garden, even while she was attending school. Aunty Lou began her teaching career at the age of 15 years and taught at the Belmont and Belair Government School. While Aunty Lou was teaching, pride did not get in the way; she went home on evenings and went in the field to assist her parents, even having to put a wash pan and bucket on her head with produce, walking around to sell to the people in the community. At the age of 23, Aunty Lou fell in love with a handsome young man from the Grenadine island of Bequia, named Basil Arrindell. They got married shortly afterwards and the union produced two children, namely Ann and Desmond Arrindell. Aunty Lou lost her husband in a freak boat accident when her children were at the tender ages of three years and eight months old. These were trying times for her, as she lost her father two years after her husbandâs death, her mother was very ill, and Aunty Lou was in the process of constructing her dream house. Being the only one at home to look after her sick mother, Aunty Lou was devastated, her inner strength did not allow her to give up, and faith saw her through. With two children to feed and no monthly income, life was a struggle, but she endured, she continued in the banana field and began rearing pigs and chickens, which she sold to the supermarkets and people in the community. Aunty Lou did it all single-handedly and made it. After 15 years of teaching, Aunty Lou resigned and became very active in the Belair New Testament Church of God, which she still attends. She became the assistant pastor and was responsible for the Adult Sunday School Class. In 2014, she received an award from the church for her dedication and years of service. She visits the Milton Cato Memorial Hospital on Sunday evenings and also the sick and shut-in in the community, offering prayers and counselling to them. Discipline was one of the virtues Aunty Lou never forgot to instill-in in the minds of those who came in contact with her. Her son Desmond Arrindell, known as âDessie,â a household name on radio, said on air that when he was a little boy, he was disobedient to an elderly woman in the area and while he was at church the woman approached his mother and told her about the incident. His mother called him, picked a limb from a peas tree nearby and in front of everyone, gave him a whipping that he will never, ever forget. Aunty Lou is famous for her chocolate, âAunty Louâs Chocolate,â a traditional morning brew enjoyed by many persons, especially the senior citizens. She produces and sells her famous chocolate to supermarkets in St Vincent and the Grenadines. She also manufactures ice, which she transports into Kingstown on weekdays to sell to ice box vendors. She works tirelessly, as she is in Kingstown as early as 6:30 a.m. to get a spot to sell her ice, get back home around midday, get something to eat, take a rest, attend church services at night and be back home in time to go to the ice house to fill bags and pack for the next dayâs journey into Kingstown. With little sleep, she is up again by 4 a.m. to start preparing for her journey into Kingstown. Aunty Lou does not have to do this type of strenuous work, as her children are all grown, but her love for the people makes her go that extra mile. Aunty Lou intentionally chose the spot where she sells her ice, so that she has the opportunity to meet and interact with school-children on their way to school and would encourage them to keep focused on their school work and also to put Christ at the centre of their lives. She also uses the opportunity to witness to other individuals as they walk along her path, by giving out tracts. In most cases, she would witness to those who are under the influence of drugs and alcohol, as they linger around the vicinity, looking hopeless and in need of help. She performs the role as counsellor, friend and encourager. It was Aunty Louâs intention when she gave up teaching to go into full-time ministry, proclaiming the word of the Lord by witnessing to anyone she got in contact with and offering guidance to those who seemed to have lost hope. Aunty Lou â a teacher, mentor, counsellor, friend â a woman who made her contribution in education, religion, business and social development in her community and to the country as a whole. A woman of strength, courage, perseverance and faith in God â A Phenomenal Woman. Mrs Muriel Dorothy Gunsam was born to Solomon and Alberta Gill on May 5, 1937 at Cane Hall. Throughout her life she has laboured hard to achieve the quality life she now lives and though many may look at her as being âwell off,â she maintains a very simple lifestyle, from her simple eating habits to her social gatherings. Mrs Gunsam worked many cold and tiring hours in England with her late husband, Lloyd Gunsam. They gave birth to two children; Judy was born in England and Colin, who was born in St Vincent. After 13 and a half years in England, she returned home to pursue their life-long dream of being partners in their own business at which time Mr Gunsam was already an established businessman in the wholesale grocery business and the exportation of produce. Mrs Gunsam, though she was eager to plunge into the business, stayed at home for one year to care for her family, in has always been second in her life, the first being God. After that year, she worked in other businesses to assist in maintaining the financial stability of her home; such businesses included WJ Abbott, Coreas and Ju-c. In the early 1970s, she decided that it was time to take ownership of her position in the family business and added an additional product to the business, her own homemade pepper sauce. This took up much of her time on Saturday afternoons, when she would sit for long hours washing, blending, bottling, labelling and sealing bottles of pepper sauce for both local and international sale. All the proceeds from this business were donated to charity. Through it all, she remained faithful to her hometown Cane Hall/Dorsetshire Hill, by providing employment, assistance to the needy, especially the elderly. She provided transportation to and from school on a daily basis for the schoolchildren at no cost and held Christmas parties for the children of the community. She has remained a pillar of strength in our local community, not only by way of financial assistance, but through her strong church ties, where she has served as a Sunday school teacher and mentor to others. She is also a stronghold to her immediate and extended family, a mother figure to everyone. Mrs Gunsam grasps every opportunity to assist and does it so quietly, without the call for recognition. She has been a provider to many families in times of natural disasters, by way of food, water and clothes to our own SVG after the explosion of La Soufriere in 1979. During the recent trough system of 2013, she extended the provisions by supplying mattresses, pillows and linen only to mention a few, along with donations from persons in Dorsetshire Hill, Canada and the USA. Assistance was also given to Grenada after Hurricane Ivan. Mrs Gunsam and her husband also donated the land on which the Glad Tidings Bible Camp building in Queenâs Drive is located to the Gospel Hall Assemblies of SVG. That facility is being used for the development of many youth in SVG. In 2009, Mrs Gunsam was honoured with the title of MBE, Member of the Most Excellent Order of the British Empire, by the Queen of England for her contributions to Christian services and her contributions to the community and business. Even now in her retirement, she continues to serve by way of contributions to schools, churches and local households.